2017 edges towards the mid-way mark of the year, as some of us may be pondering what we have achieved over the first half of the year. Or how much of our new year resolutions have we accomplished? Time and tide wait for no man, and each of us should just focus on pursuing our own dreams and aspirations, and not judge what goals others chase by our own irrelevant yardsticks. To each his own, and as long as it brings that person happiness, who are we to judge? The summer months are upon us, and temperatures are hitting uncomfortable highs again. It would not be a surprise if ambient temperatures around the world hit records again this year. It is therefore lamentable when the world's largest economy has decided not to collaborate with the rest of the world on climate change mitigation strategies. Choosing that path will probably set back efforts made in the last few decades, and we can only face the consequences with the rest of the world, as we share the same old mother earth. The local economy continues to appear weak, as far as the industry that I work with, is concerned. As many companies struggle with costs and business sustainability, governmental agencies are pushing for more collaborative business models and the increased use of technology. For many companies, it is a time for contemplation about the future of the business and how to remain competitive and yet profitable. 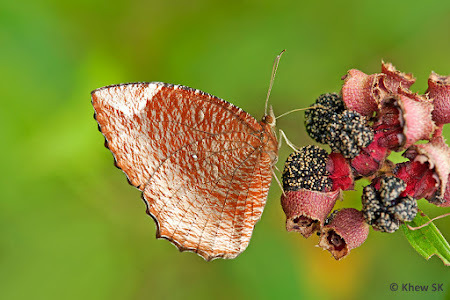 Change is certainly in the air, and time is of the essence. In Singapore, it would be difficult for any coffee shop talk to avoid making reference to the current dispute amongst the siblings of a most prominent family. A personal take on this, is that the matter that is being debated heatedly across all portals of social and mainstream media, is a private matter that should be settled amongst themselves and not dragged out in the open as a free show. And like most things on social media, everyone would have their own theories and opinions, whether welcome or not. 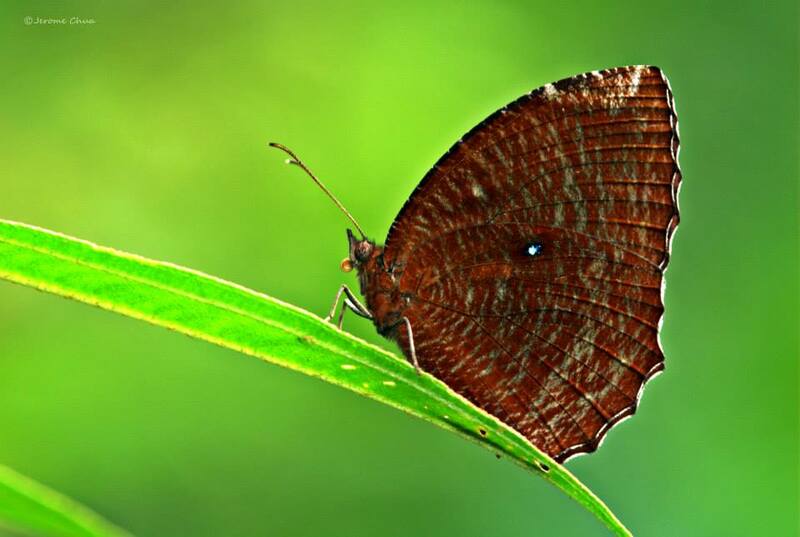 Hence back to our world of butterflies where life is probably still more innocent and simpler. 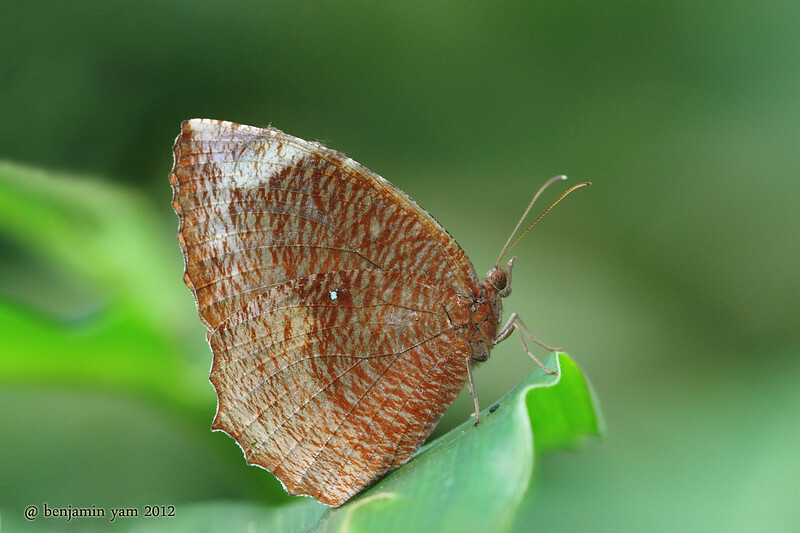 This month, we feature a common urban butterfly, the Common Palmfly (Elymnias hypermnestra beatrice). This species is rather widespread across Singapore, where it can be seen in urban gardens, parks as well as the forest fringes. 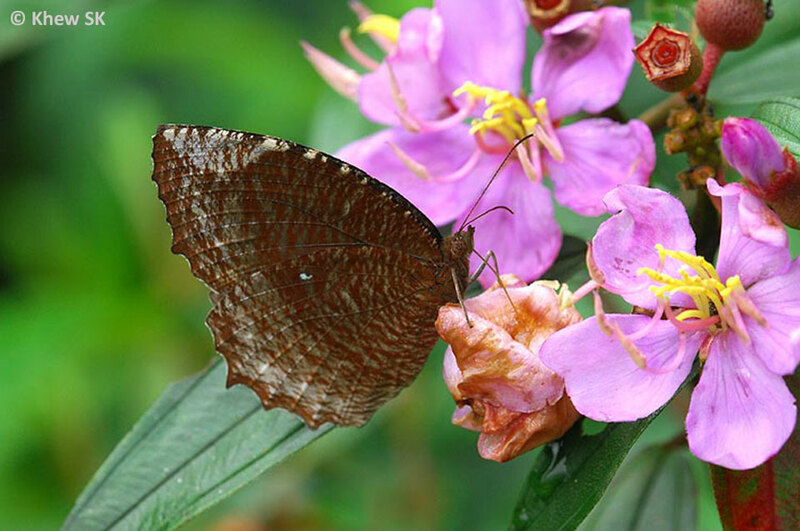 As its caterpillars feed on many varieties of ornamental palms this 'boring' looking butterfly is very much a part of our urban biodiversity in Singapore. A mating pair of Common Palmfly. 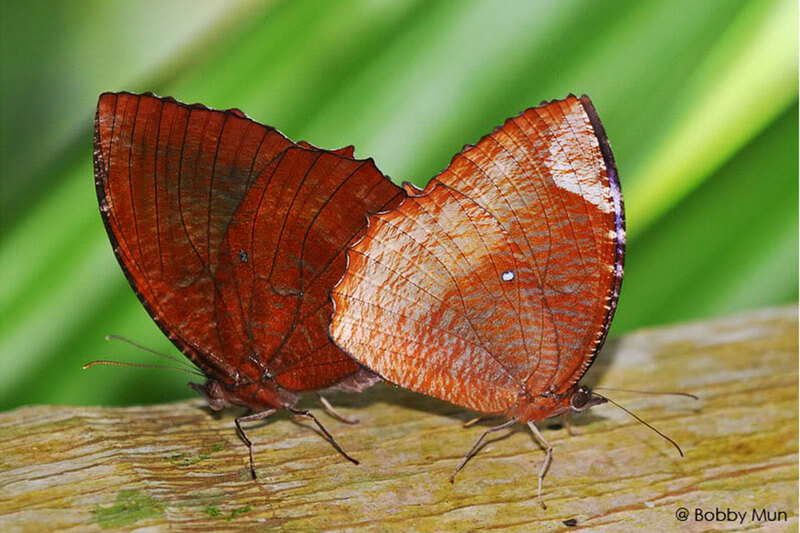 Male on the left, female on the right. 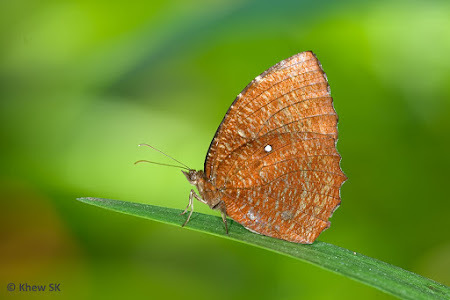 The Common Palmfly belongs to the subfamily Satyrinae, often referred to by the common English name of "Browns and Arguses". 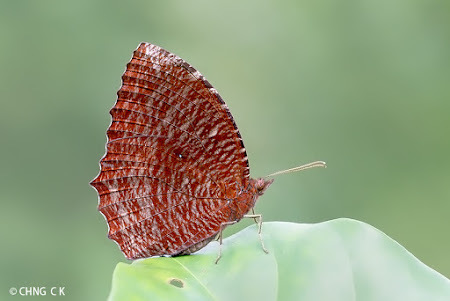 They are typically drab-coloured butterflies, usually ornamented with cryptic patterns and ocelli on the undersides of their wings. 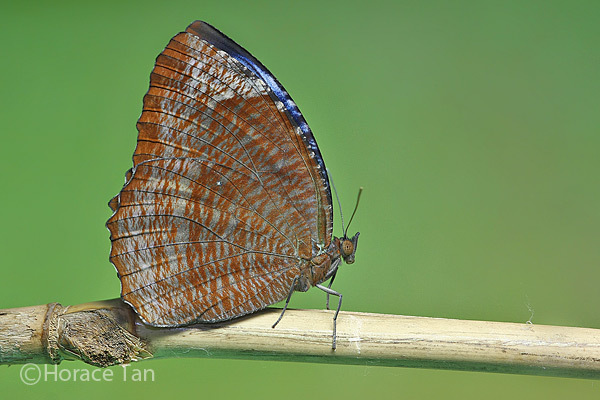 Satyrinaes prefer shaded habitats under the tree canopy and normally fly at low level amongst the shrubbery. 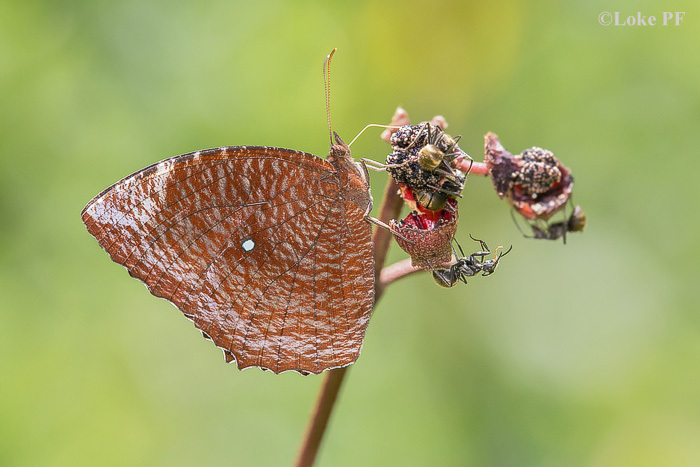 For a large number of species in this family, their caterpillar host plants tend to be monocotyledons like grasses and palms. On the upperside, the Common Palmfly has bluish-black forewings with light blue submarginal spots. The hindwing is reddish brown. 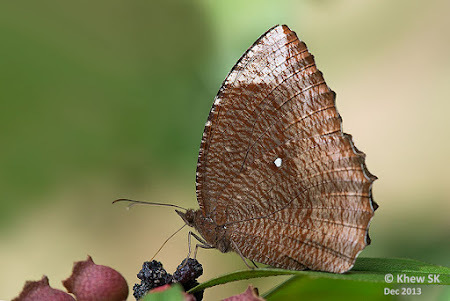 The underside is speckled with reddish-brown striae that is very variable. 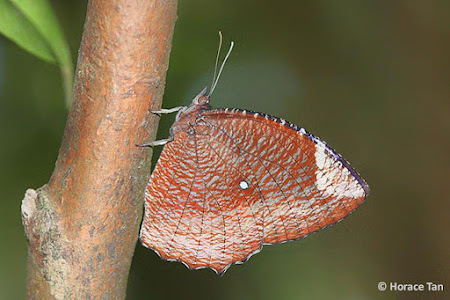 The general appearance on the underside of the Common Palmfly can vary quite a bit in terms of the physical features and also the colour. Females tend to be lighter coloured with the submarginal areas on both wings lighter. 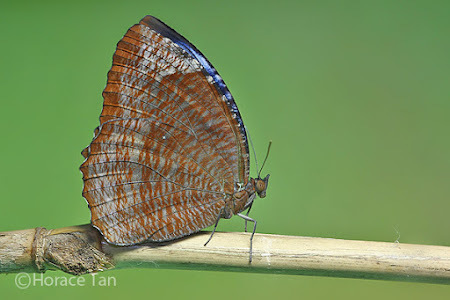 The males can be much darker and appears almost a dark purple-blue in some examples. 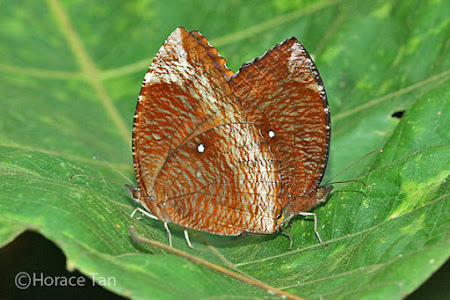 In most examples, there is a white spot on the costa of the hindwing. However, there are some individuals where this white spot is significantly reduced or even totally absent (causing some observers to assume that they are looking at a different species of butterfly). 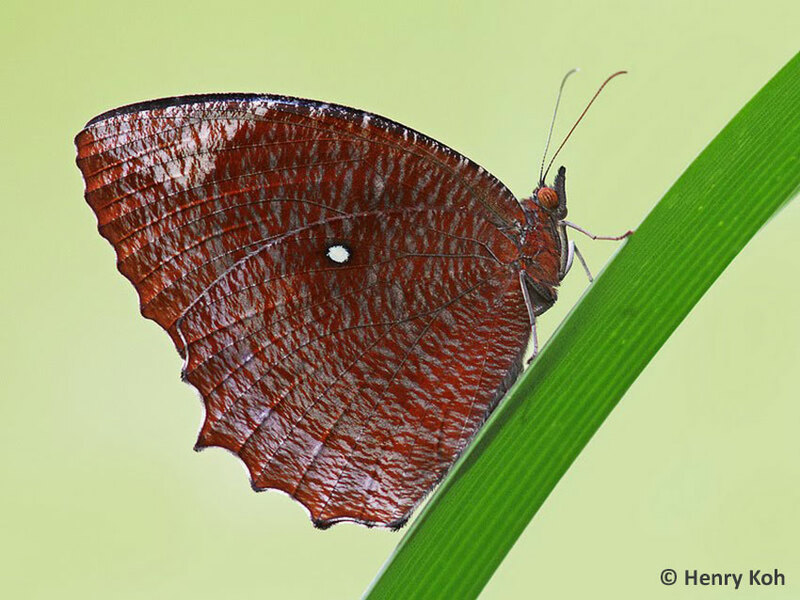 In my early years of collecting butterflies as a kid, we referred to this species as the "Thumb Print Butterfly". 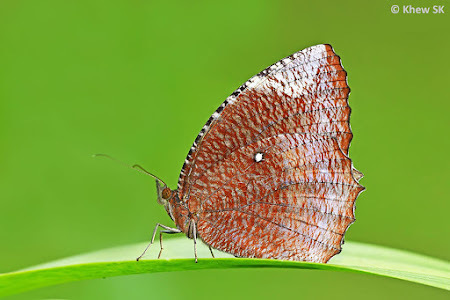 This is because the apical area on the underside of the forewing has a lighter patch with reminds one of a thumb print on the butterfly's wing. 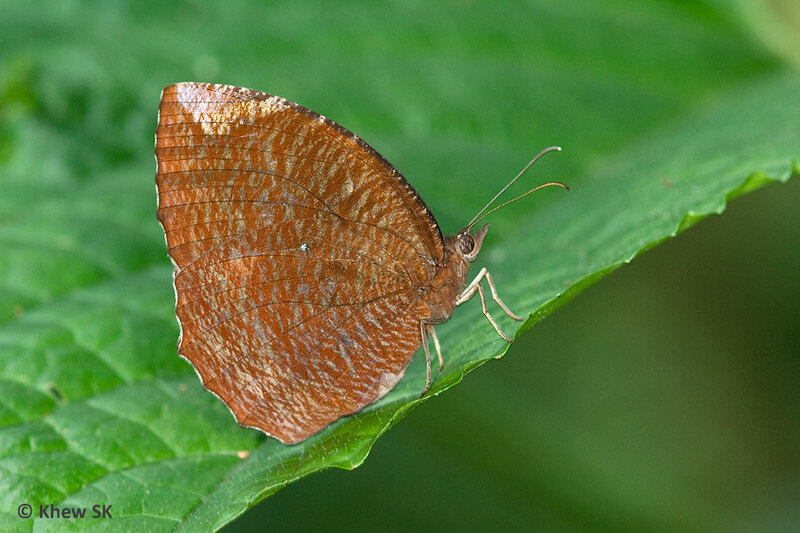 The Common Palmfly is skittish and is difficult to approach when it is alert. It takes short 'hops' amongst the shaded undergrowth and stops with its wings folded upright, all ready to take off again should an intruder enter its circle of fear. A unique behaviour of this species from field observations is how the butterfly occasionally stops on the surface of a leaf, walks on the leaf using its legs, then then flies off to another leaf and repeats this behaviour. Some local examples of its caterpillar host plants are : Ptychosperma macarthurii (MacArthur Palm), Cocos nucifera (Coconut), Dypsis lutescens (Yellow Cane Palm), Caryota mitis (Fish Tail Palm). Undoubtedly there will be more species of palms that its caterpillars feed on. 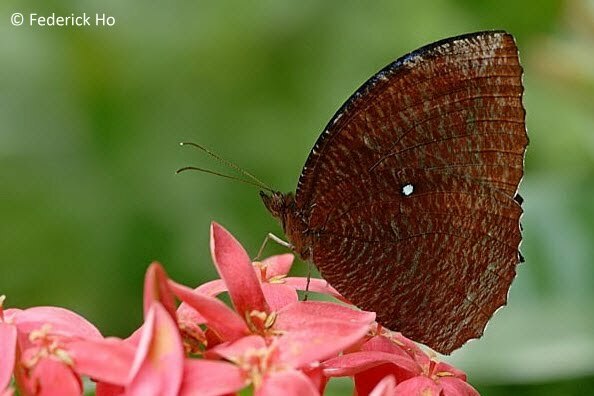 Many of these species of palms are used in urban landscape design, and this explains why the Common Palmfly can be seen in urban residential gardens, particularly where pesticides are not used regularly. The caterpillar feeds in a very neat way of making a straight cut across the leaf of the palm making it appear as though someone had cut the leaf with a pair of scissors. 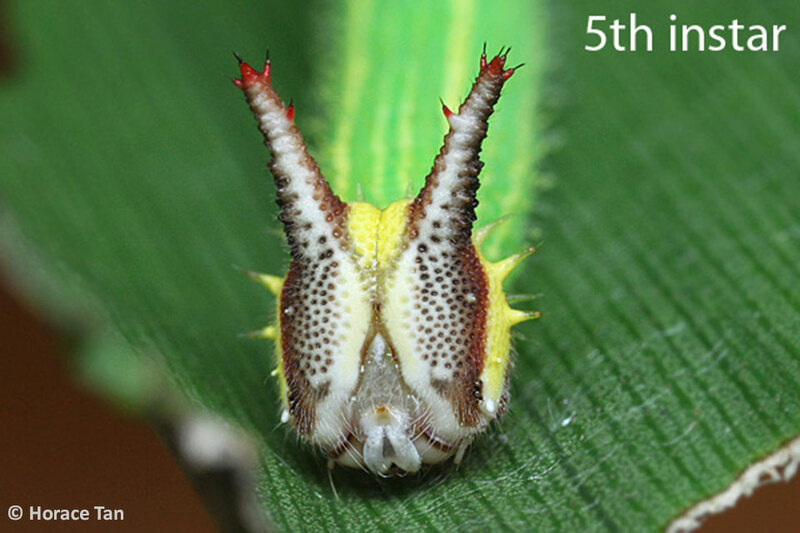 The caterpillar has an interesting appearance with 'horns' on its head, giving it a cat-like appearance. The full life history of the Common Palmfly has been successfully recorded here. Text by Khew SK : Photos by Chng CK, Jerome Chua, Federick Ho, Khew SK, Henry Koh, Loke PF, Bobby Mun, Horace Tan and Benjamin Yam.